The 2019 BMW X4 compact crossover will be available in July. SPARTANBURG, S.C. — Even before you slip into the driver’s seat of the second-generation BMW X4, the compact crossover reveals its soul: more spirited coupe than grocery store runner. The 2019 BMW X4, which goes on sale in Canada this summer, has sportier proportions than the first generation, with wider tracks, the latest-generation suspension settings, a lower centre of gravity and improved aerodynamics. A sloping roofline makes its profile look more coupe than SUV. The design cues are meant to deliver a message of sportiness and athleticism, BMW X4 project head Joachim Dunkel told Automotive News during a driving event here. “When you see the car the first time, you see the muscle and sportiness, and when you see the inside of the car and drive this car, you can feel it,” Dunkel said. Development of the 2019 X4 began in parallel with the current-generation X3, which was introduced last fall. More than 200,000 units of the first-generation X4 have been sold worldwide and 19,712 in the United States, since the outgoing model was launched in 2014. Canadians have purchased 4,385. 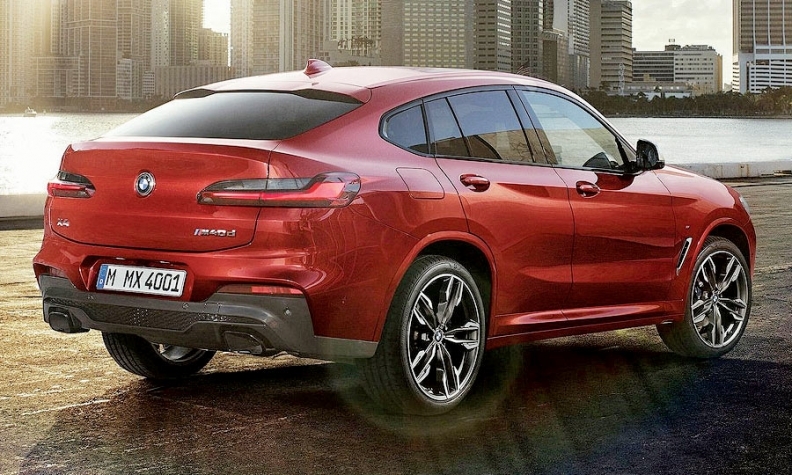 The X4 comes in two variants. The xDrive30i is powered by a turbocharged inline four-cylinder engine that generates 248 hp and 258 pound-feet of torque, propelling the vehicle from 0 to 60 mph in six seconds. 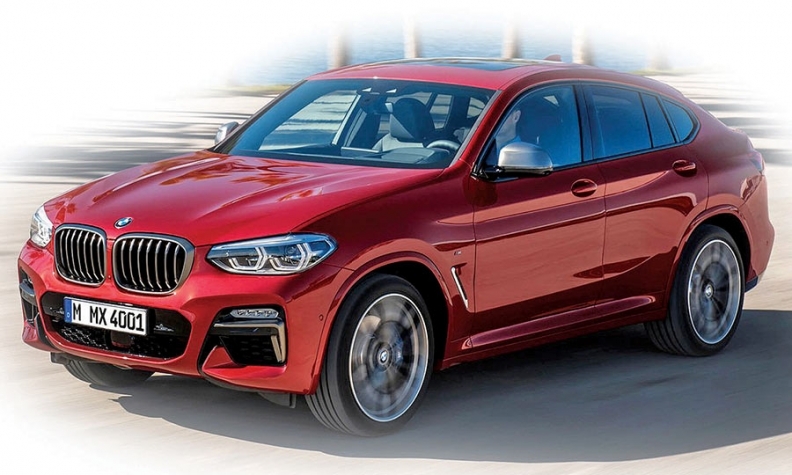 The BMW M Performance model — BMW X4 M40i — is powered by a turbocharged inline six-cylinder engine that delivers 355 hp and 365 pound-feet of torque. It accelerates from 0 to 60 mph in 4.6 seconds. The 2019 X4 has a longer wheelbase, which provides a more comfortable ride and better cornering, said X4 product manager Ralph Neuberger. The rear has a wider track for better driving dynamics and slimmer LED taillights with a three-dimensional design. The front of the vehicle also received design changes, including rectangular fog lights and large outer air intakes. The signature BMW kidney grille is 30 per cent larger than the previous generation, helping with cooling and improving fuel efficiency, Neuberger said. BMW said it used a mixture of aluminum and high-grade steel to reduce weight, not just in the chassis design but also in the body’s construction. Using a higher proportion of aluminum and high-strength and ultra-high-strength grades of steel strengthened the body structure, improving vehicle agility and occupant protection. The car additionally has a significantly lower centre of gravity, which improves cornering dynamics, according to BMW. Aerodynamic drag in the next-gen X4 has been reduced by about 10 percent by streamlining the body and adding features such as an active air flap control, air curtains in the front apron and additional underbody cladding, BMWsaid. The X4 might be marketed to dads who dream of being race car drivers, but it also has accoutrements and conveniences targeted at suburban moms. The redesigned X4 has an inch of additional rear leg room over its predecessor. The vehicle comes standard with a suite of safety features, including frontal collision warning and emergency braking. When a collision is imminent, seat belts tighten and the windows and moonroof close to a small gap. Standard navigation comes with a 10.25-inch display and offers drivers multiple ways to interact including touchscreen, iDrive Touch Controller, voice control or the optional 75 percent larger, colour heads-up display. Dunkel said the X4 is geared toward “extroverts” who want the cargo space of a crossover and the design and driving excitement of a sports car. The X4 will be available next month, with pricing starting at $53,000 for 30i, and $66,000 for M40i, before destination fees. The X4 is built at BMW’s plant in Spartanburg, S.C.